Quinoa somehow, a superfood that only health advocates have known about for years is now common fare for a wave of healthy eating at local restaurants and delis. Although there is no accounting for taste or trends, quinoa does have some powerful health benefits. It tastes great, it is high protein, and it is part of another major food awareness of today: gluten free eating. Although referred to as a grain, quinoa is actually a seed from a vegetable related to Swiss chard, spinach and beets. Quinoa is pronounced "keen-wah," not "kwin-oh-ah.". 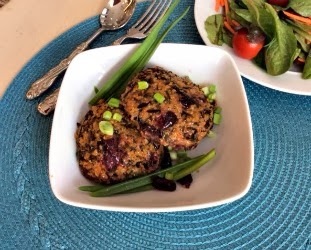 These quinoa and sweet potato patties are a delicious meatless dish; they almost make me think I'm eating a chicken cutlet or meatball, without the meat of course yet they are packed with a ton of protein and nutrients from quinoa and sweet potatoes. Preheat oven to 400 degrees F. Place cubed sweet potatoes on a lined cookie sheet, drizzle with olive oil, and sprinkle with salt and pepper. Roast in the oven for 50 minutes, or until sweet potatoes are tender when pierced with a fork. Remove from the oven and allow to cool. Place in a blender or food processor and puree until the sweet potato is smooth and creamy. Place in large bowl. Meanwhile, bring 2 cups water and rice to a boil in a medium-size pot over medium-high heat. Stir once, reduce heat to low, and simmer for 50 minutes, or until rice is tender and all water is absorbed. Remove from heat and allow to sit for 10 minutes. Fluff with fork and then transfer to bowl with sweet potatoes. In the bowl with the sweet potatoes and rice, add cooked and cooled quinoa, scallions, cranberries, sage, salt, and pepper. Combine well. Form the mixture into 1 1/2-inch balls using your hands and then flatten to form round patties; place on rimmed baking sheet sprayed with cooking oil. Note: Glick's cooking spray is not only gluten and dairy free but soy free as well. Turn down oven temperature to 350 degrees F. Bake until patties are lightly brown, crisp on the outside, and do not break or split when transferred, about 45-55 minutes. Flip patties with flat spatula 30 minutes into baking process. Serve warm or at room temperature. Store in the refrigerator up to 3 days. Thanks again for visiting my blog. Please remember to sign up for all my upcoming recipes and updates via the subscription box on the top right side of this blog. Have a great day!